Producer Lauren Shuler Donner recently spoke with Coming Soon about her upcoming release for FOX, "X-Men Origins: Wolverine" and gave some cool insight to what we will expect from the film, but more importatly teased about a possible Deadpool spin-off! Lauren Shuler Donner, yes she's the wife of Richard Donner, said that she would love to see a Deadpool film get made and that Ryan Reynolds is perfect as the mercenary. Donner said to Coming Soon when asked if there might be a Deadpool spin-off, "I hope so. I really hope so. He's [Ryan Reynolds] so good at it." Nothing else was said, but with comic book films all the rage now days, I would put this as a very high possibility of actually happening. Deadpool is an amazing character with alot of laughs, but may be a hard sell, just like Punisher. It is a dark story, but Wolverine is huge and Batman darkness didn't scare away movie goers, so the hold shouldn't be there. Ryan Reynolds is a big enough star that with a few more Marvel characters thrown in, fans would flock to go see Deadpool. 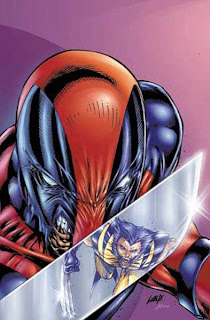 The fact that Wolverine and Deadpool once worked together is a huge bonus, can FOX can always throw Hugh Jackman for a show down between the two mercenaries. Marvel fans love Deadpool and his humor, so Reynolds is a perfect fit and hopefully more sooner than later, we'll get this film!